Combat The Closing Techniques - The Ben Franklin CloseEliminate The Muda! Truly a very special American; Ben gave so much. As a writer (an early form of blogging?) he helped to teach Americans about frugality and wise money management. He loved music and gave us the glass armonica. Franklin was a scientist dabbling in the magic of electricity. Our founding father was also an inventor; creating a variety of items including bifocal glasses and a new wood burning stove. He was also an entrepreneur starting our countries first fire company and fire insurance company. Do you think he didn’t trust his stove? Ben was also a salesperson. He continues to this day and has been selling his ideas to generations since his death. However, there are also sales people that are using the respect and admiration we all hold for Ben in a closing technique named after Ben himself. This post was honored with a selection to the Best of Money Carnival hosted by Reduce Debt Faster. Please stop by to take a look at several other great articles! Maybe you have seen this closing technique; if not from a sales person then surely from your parents. This approach is used when a person is having a hard time making a decision. They have not said no, but they have also not said yes. Note that the salesperson will always ask you to write down the negatives first. This is done for two reasons. First it is informative to know any and all objections to buying. With this information they will be in a better position to find a way to sell you their product. Negative responses are also first because a salesperson does not want you to end your thoughts on a negative note. Your salesman is not going to be very helpful while you talk yourself out of the product. But once you have listed your four or five reasons they will be happy to help you list the reasons to buy. Being in a more knowledgeable position the salesperson now has a chance to overcome any of your objections or trivialize them to the point of insignificance. You have only two options; play the game or refuse. Refusing might be the best path for most. Without showing your hand they have little to work with. Keeping salespeople in the dark is rarely a bad thing. On the other hand you could play if you feel adventurous. The key to playing is to understand that there are no rules. Make the salesman fill out the form as you dictate. Decide to list the positives first, giving you insight on how to develop some negatives. You can even take it a step further and ask the salesperson to help. After completing the form, ask the salesperson to list all the reasons other customers gave not to buy. Think for a moment of a situation in your past where you could have used this approach to gain support from another. It may have been a sale you were trying to make or convincing a friend to volunteer for a charity event. There are many situations that this approach can be used to let a person convince themselves to make a decision. As long as you are knowledgeable about the subject and prepared to help list all the positives you are likely to succeed. Readers: Have you ever been given a Ben Franklin close? What was it for and who used it on you? Would you ever use this approach to help convince your kids of decision, like what school to go to? Very interesting concept. I’ll have to think about this for the next time I make a big purchase. The world could use another Ben Franklin these days! .-= Evan´s last blog ..Comparatively Speaking A Million Dollars is Still a lot of Freaking Money =-. Wish I had something more to add, but just wanted to reiterate Evan’s point. .-= FinEngr´s last blog ..3-Month Performance Review =-. @ FFB – Personally, I could use a lot of franklins 🙂 Thanks for visiting! @ Evan – Thank you sir! @ FinEngr – And you as well! I think I’ve been caught. I’m in the middle of doing it on my blog–not as a means to get people to buy something though. I wrote a post asking people to give all their reasons for keeping clutter around . . . next week, I’ll try to get people to generate reasons to get rid of clutter around the house. I’ll see how it goes. .-= Simple in France´s last blog ..Travel without looking like a tourist =-. As the others say and I’ve said before, this is indeed a super list of posts. Regarding Ben Franklin, he was indeed a legend. Do you know he is a big hero of Warren Buffett and his sidekick Charlie Munger? In fact the latter is something of a authority/fanboy on him! .-= Monevator´s last blog ..Earn more money by tackling your mental beliefs =-. I’ve had this tried against me before, unfortunately for the saleperson (actually it was a saleman, but I’m being PC)… It made me think of a ton of cons, and when he suggested the pros, I was able to shoot them down as trivial. The technique convinced me to walk out of the store. One note about Franklin that I think is pretty cool… He didn’t become an inventor until after he retired at the ripe old age of 42… I thought those were some pretty interesting facts! .-= Money Reasons´s last blog ..What I Have Learned To Date From Blogging! =-. Wow this is one hell of a closer! I go cold when people try and lay sales techniques on me…. In fact o often tell people to leave me alone while I make the decision with no outside influence (or so I believe, I am sure these sneaky salesmen have mastered Jedi Mind Tricks by now!) and then only require them if I want to buy. I actually get a little upset when I see people falling into the salesperson trap!!! .-= Forest´s last blog ..FREE DOWNLOAD -Tribes: We Need You to Lead Us by Seth Godin =-. @ Simple in France – What a great idea! @ Monevator – Though it has nothing to do with this post. 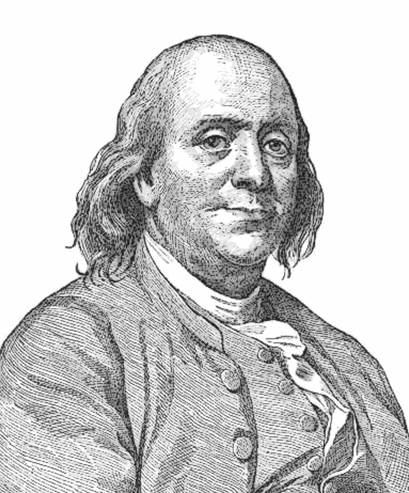 Franklin is seen by some as one of the forefathers to the Lean movement which is the basis for my blog. Henry Ford was another big fan as well and how I got turned on to him. @ Money Reasons – Obviously the salesman was not properly prepared if you destroyed him that badly! But good for you! I did not know that he didn’t invent until his retirement. It give me hope that I still have a chance too! Wouldn’t that be a great way to spend your time? @ Forest – Sounds like you may be on to something in developing a strategy against the salesmen! While I understand why you would get upset, I actually have mixed emotions. After-all in most cases they are just making a living like the rest of us. It’s when they take advantage, manipulate and lie to get the sale that I get pissed. I just realized Greg-san, that your initials are LLC! How cool is that?! .-= Financial Samurai´s last blog ..The Ripples OF Giving =-. As a true Sales Professional, These tactics are strictly for amatures. As a professional, I know my product. My presentation is to the point with out the use of smoke and mirrors. I have a closing rate of about 88% currently. I think the salesman that uses tactics and tricks like these are scum bags. When you offer a quality product, quality service and do that with a level honestly, smart buyers see that (and feel it). I feel sorry for those that have to lower themselves to doing that. If they would spend more time learning how to access their customers needs, they would find their closing rate increase. Need accessment is the most important part of the sale. There is an old saying all sales people should remember. “You were born with two ears and one mouth, Listen twice as much as you talk”. Combat The Closing Technique - The Consultative Close « Eliminate The Muda!